How Much Will Blinds Installation Cost? Window treatments are an integral part of any house’s finishing. They are as aesthetic as they are functional. The right window treatment will keep off those prying eyes while giving you a beautiful interior décor. Moreover, if you go for the right solution, you can use it to save on your energy costs by controlling how fast your home cools or heats up. One of the most common types of window treatments would be the blinds. Blinds installation will give you all the benefits of a good window treatment without costing you a fortune. How Much Will It Cost To Install Blinds? The cost to install blinds will vary depending on a number of factors like the design, material, and overall blind size. On average, most homeowners will spend around $700 to install impressive blinds on their windows. Expect to spend as little as $100 on smaller windows that require simple blinds, and up to as much as $2,000 on bigger, more complex projects. The idea of blinds installation will always evoke a discussion about shades. The difference between these two window treatments is simple and straightforward. Blinds are solid and opaque. Shades are lighter and allow light to go through. Consider the labor rates. Blind installation is simple and you will get very friendly hourly rates from your carpenter or "handyman". Always get a couple of quotes before hiring to ensure that you get a feel for pricing trends in your region. The cost to install blinds will vary depending on their actual design – and so will the functionality. If you are concerned about getting the cheapest blinds, you should go for horizontal blinds. They are perfect for a vintage look and are comparatively easier to operate. Vertical blinds, or Venetian blinds, on the other hand, could be costlier but have the benefits of doubling up as shades especially if you don’t draw them completely. At the end of the day, your budget and décor preferences will dictate the type you go for. The cost to purchase the actual blinds will depend on the material they are made from. The most common material in the market is aluminum, vinyl and wood. Aluminum and vinyl are the cheapest. Wood blinds installation would be more expensive, with the price varying depending on the type of wood you choose. Apart from dictating the blind’s versatility and glamor, the material will have a say on how long you will have before replacing your blinds. Wood blinds are generally more attractive, warm and long lasting. You can sand and finish them when they lose their glossy finish. Vinyl and aluminum, on the other hand, is easy to clean but has a less pleasant look. 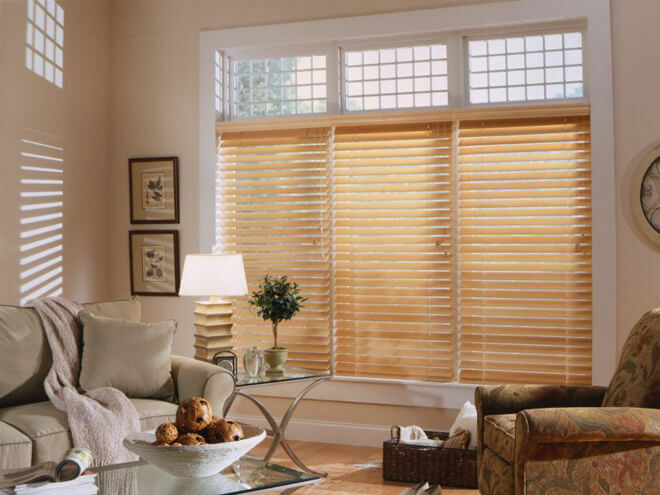 Don’t expect your vinyl or aluminum to impress as the wood blinds installation would. Using faux wood is comparatively cheaper than the real wood blinds and plays the role perfectly. If you would like a more accurate breakdown of the cost to install your blinds at home, Homes Ace will be able to put you in touch with professionals in your are for a free estimate. Simply enter your zip code in the space provided to receive your 100% FREE installation quote from local contractors in your town or city. Remember, this offer comes with no obligations to sign any contracts or make any purchase. It's a great way to decide what will be possible given your budget, so feel free to enter your home zip code now!